With the ICE660 trimless angled in-ceiling LCR speaker , you'll get imaging and staging that would be lost with regular, down-firing ceiling speakers. Features include a sturdy 6.5"" Kevlar woofer fixed at a 15-degree angle, a 1"" aluminum dome and 150W power handling. You can even use them for Dolby Atmos front, rear and side surrounds in a 5.1 or 7.1 system. What Are the Benefits of an Angled In-ceiling Speaker? The angled speaker is a real problem solver because not every space is ideal for custom home theater sound applications. 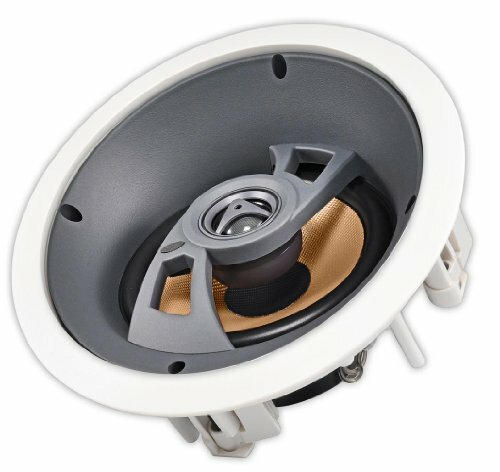 The angled in-ceiling speaker features a 15 degree angle for the mid bass driver plus a pivoting tweeter for placement flexibility. This speaker can be part of three piece set to handle the front stage of the surround system when both on-wall and in-wall are not a favorable option. The angled design allows the ideal placement in the ceiling closer to the wall just above the monitor. Dimensions: 10-1/2" x 5"; Cutout: 8-1/8"